Japan’s football revolution began at the AFC Asian Cup back in 1992, when they hosted the tournament and won the first of their four continental titles. Three decades later, Japan national football team is Asia’s premier side, while Japanese football and its self-sustaining model has set the benchmark which many aspiring countries, including India, are trying to follow and achieve. 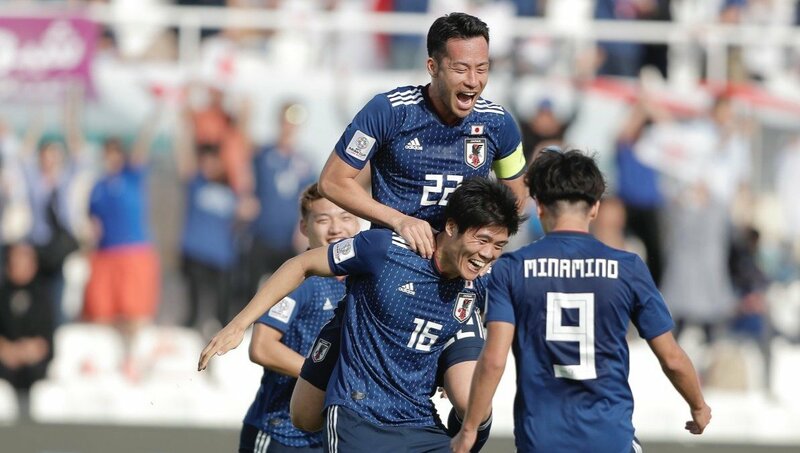 Japan national football team players celebrate after scoring against Saudi Arabia in the AFC Asian Cup Round of 16 match in the UAE (Pic: AFC Asian Cup). By the time Kei Nishikori, the king of the gruelling five setter, had begun his comeback at the Australian Open on the Margaret Court Arena in Melbourne, Japan had already kicked off their AFC Asian Cup football Round of 16 game against Saudi Arabia. Which, of course meant, Yuta Yoshida was watching the football. For all his cult popularity in Japan, Yoshida’s acceptance, Nishikori could not peak. To be fair though, by the time Yoshida switched channels, he had already watched two and a half hours of Nishikori’s toils against Pablo Carreno Busta in the Aussie Open Round of 16. 20 minutes into the channel switch, Japan opened the scoring. Yoshida lit his first cigarette of the evening. The scored stayed that way for the next hour and Japan, as per norm, proceeded through the quarterfinals of the Asian Cup. But it isn’t the norm. Or shouldn’t be, but is. Japanese football is widely considered now to be the premier standard for Asian football. They have won the Asian Cup the most times (4 titles), have qualified for the World Cup for the last six editions straight and have some of the best club teams on the continent. Surprising then that their Asian Cup debut was as recent as 1988 — where they got one point, zero wins and were knocked out in the group stage. And so to the ’90s and a decade of reinvention for Japanese football. A lot of credit for Japanese football’s brilliance is given to the J League (and Brazilian football legend Zico) and its systemic nurturing of players for the national team. There is a certain truth to this, but that was 1993. A year after Japan won the Asian Cup. Playing at home. Yoshida, who designs internet security for an online marketing company in Gurgaon, India, was 12 when the Asian Cup landed up in the Hiroshima prefecture. Three stadiums took up the responsibility of hosting the matches, and such was the interest in football in Japan at the time that the stands for the tournament’s opening game (in Hiroshima) practically empty, recalls Yoshida. “Hiroshima didn't have much football culture at the time,” he says. It didn’t help of course, that the two teams taking to the field that day were Saudi Arabia and China. Japan’s next two games, against North Korea and Iran, were played at the Hiroshima Big Arch. Yoshida never went to those, but remembers the legend of the Iran game vividly, through oral recollections from friends and ex colleagues. Briefly put, Japan won 1-0, Iran ended the game with eight men, and were knocked out of the tournament. That is too simplistic though. So, at halftime of the Japan-Saudi Arabia game, Yoshida puts on the highlights from ‘92 for everyone’s benefit. There is an arthouse quality to the video, and it is only magnified by the brilliant editing — the ominous high pitched score perfectly complementing each Iranian attack. The commentary though constant is appropriately sparse. The footage flickers at the important moments. Yasujiro Ozu would be proud of the simplicity of the video. It is simple, yet you get the point. Japan were outplayed, but never overawed. Most importantly, the stadium was packed. Yoshida chuckles when this is pointed out to him. To understand the legend surrounding this game, it is essential perhaps to understand the legend surrounding the lone goal scorer in that game — Kazuyoshi Miura. Miura was 25 at the time, not really the young prodigy most stories will have you believe. He is 51 now, and still playing professional division football in Japan. Miura’s name belies a certain amount of anxiety in Yoshida’s voice. Miura is Japan’s first footballing superstar. He is on billboards across Japan, was the first MVP of the first season of the J league, and played for Genoa and Santos in a generation long career. He scored 14 times in qualification for the ’98 FIFA World Cup but was dropped from the final squad that went to France. Yoshida — and countless others on Reddit forums and Japanese gossip mags — believe it is that humiliation that keeps him playing even today. For a country with a a life expectancy of 83.8 years (the second highest in the world according to the WEF) Miura epitomises productivity in maturity. He is quite simply the trampoline from which Japanese football launched itself into the world conscience. 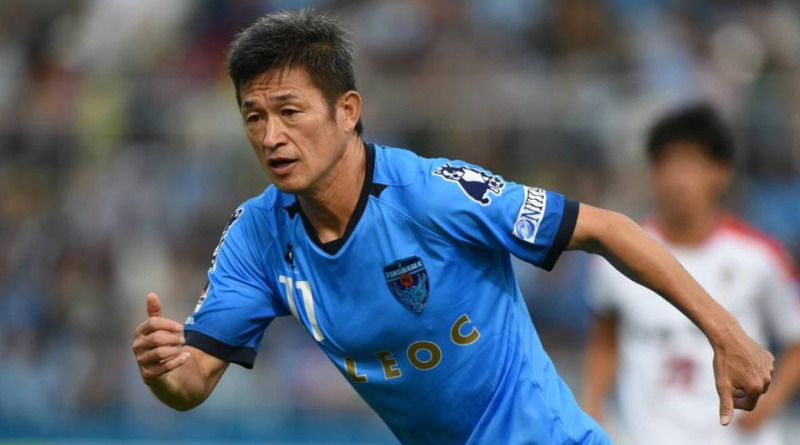 Kazuyoshi Miura, Japanese football's first global superstar, is 51 now and still plays professional division football (Pic: Twitter, J League). That simply taken goal catapulted Japanese fans’ belief in their team to the stratosphere. The players themselves seemed to have some newfound belief in their own abilities. Japan romped on. They conceded within the first minute of their semifinal against China, but stuck on, to win. And then, just like they did on January 21, 2019, on November 8, 1992, they beat Saudi Arabia 1-0, courtesy of a goal in the first half. They were champions of Asia. A significant amount of success in organised sport is about seizing opportunity. Or, as the art critic, Harold Rosenberg, smartly said in context of street photography, ‘loiter in the neighbourhood of a problem, after a while a solution strolls by’. Japanese football’s lack of a professional club system was a problem. The J League, launched in 1992 (but not active till ’93) was supposed to counter that problem. The Asian Cup success, at home, in front of a rapidly increasing fan base, turned out to be the catalyst for change. Philip Iglauer, a Seoul based reporter for the tech news website ZDNet, recalls the craze that surrounded the initial days of the J League. Iglauer was writing for the Asia News Network at the time and travelled to Japan to cover diplomatic affairs frequently. “Despite being of American descent, and lacking interest in football, it was tough to ignore the signs of a pop cultural change at the time,” he says. Basking in the glory of the Asian Cup success, the J League launched with ten teams (eight from the erstwhile Japan Soccer League 1st Division, one from the second, and a newly created club, Shimizu S-Pulse). The smallest of these clubs was Sumitomo Soccer Club, who were promoted from the second division and considered for the J League, aided no doubt by the simple fact that they had an ageing yet widely popular Zico in their ranks. Rebranded the Kashima Antlers, they finished second in that inaugural season. “It was a memorable model, but not a highly sustainable one,” says Iglauer. For a while it was outstanding, simply because the public was able to see some of the biggest names in the sport turn up on the pitch,” Yoshida says. But soon, attendance dropped. Salaries stayed up, and clubs, forced to balance their books, started adopting subtle cost cutting measures. All of it meant Japanese football, from a peak, started plateauing out. 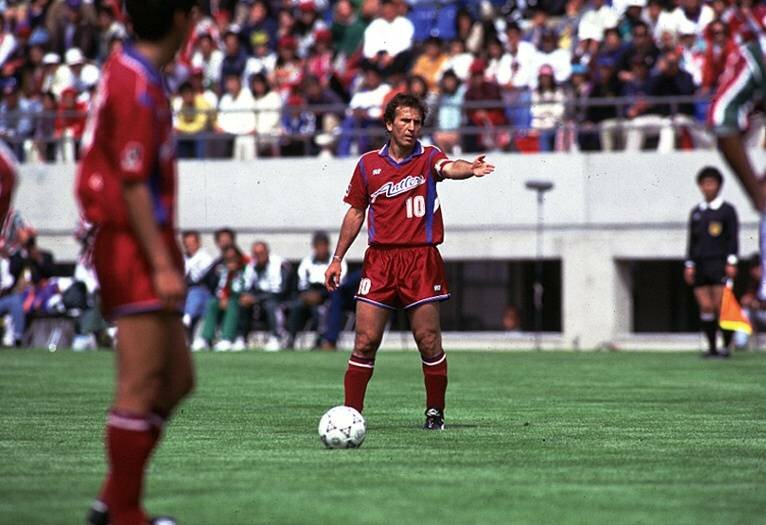 Brazilian football legend Zico calling the shots while playing for Kashima Antlers in the J League (Pic: Courtesy Antlers). Iglauer — for no reason whatsoever other than the fact that he is speaking to an Indian — compares this situation to the Indian Super League (ISL). “Attendances are low now aren’t they? I think, and correct me if I am wrong, but the marquee signings are also a bit low key now. I’m sure the games are still good, and perhaps very competitive, India, after all, were a surprise at the Asian Cup, but I’m sure the media there and the fans are now flattened out by the first days,” he says. Where India’s football is still battling the fight for two leagues though, Japanese football had none. Seeing the decline and the significant lack of grassroots activities, the Japanese Football Association (JFA) insisted each of the J League cubs start build community relationships through academies, and other non-footballing activities. This simple idea of ensuring that even in a top down pyramid structure clubs were forced to engage within communities and build and sustain infrastructure paid great dividends for Japanese football’s future. Aikman, Iglauer and Yoshida all stress about the amount of football played in Japan today. Born out of the 100 Year Vision, Japan’s professional footballing pyramid now has 51 teams across the three divisions in 36 prefectures. Each club is required to prove their financial stability season on season, and, if they incur losses for three consecutive seasons, they lose league membership. Additionally, clubs are fed through youth academies, which in turn are constantly recycling their finances towards a football programme in schools and universities. Aikman believes that more than just the constant conveyor belt of players, Japanese football’s model offers more to grow the sport. “To grow the game, you have increase the knowledge of the game too. One lasting legacy of Hans Ooft was that a lot of his players became coaches, and he also (coming from the Dutch model), ensured he created a system for the game to endure and trickle down to the grassroots. At every level you want the knowledge being imparted to be correct,” he says. Coaches across different classes, and with varying certificates are abundant in the Japanese football pyramid. And coaches are the tip of the iceberg. In interviews, the previous head of referees for Indian football Col. Goutam Kar often stressed on India needing to follow the Japanese model for referee initiation. By his estimate, India has about 7,000 referees, half of whom are operational at the competitive level. Fewer than 200 are Category 1 referees (qualified to referee competitive league matches across divisions). The real beneficiaries of all of this are the players themselves. Japan may or may not go deep in the Asian Cup in 2019, but playing with what is widely considered a development squad, they are creating the stars of the future. Of which there is no shortage. Miura aside, there are several Japanese footballers who are household names now. Iglauer goes to the extent of saying they are Asian stars, and he isn’t wrong. Between Hidetoshi Nakata, Junichi Inamoto and the Shinjis (Okazaki and Kagawa) there is a decade, but there star power is strong. A huge amount of credit here must be given to the JFA, whose long-term vision helped create a sustainable football future. Creating programmes and facilities for producing players in the mould of Miura is only a part of it. Miura has been a part of the system, without perhaps forcing its direction directly. That onus has fallen upon the 21 other members of that famous ’92 team. The men who won the first of Japan’s four Asian Cups may not have held management level decisions that affected the sport, but in their own way each of them ensured the smooth transition of a legacy. Four members of that team retired and walked off quietly, football removed. Two walked off the pitch and into a commentary booth. Besides Miura, another, Masashi Nakayama still plays as a professional. Thirteen members of that 22 man squad transitioned from retirement into a coaching career and it is one of them, Hajime Moriyasu, who helms the national team now. At the final whistle, Moriyashu punches his fist and walks over to shake his Saudi counterpart’s hand. Japan go through, and so Yoshida switches back to Nishikori. The marathon match is still on. The remaining one, and Yoshida giggles while spilling this information, Takahiro Yamada, is also still involved with football, and does more than anyone else for the promotion of the game. He is the manager of an Irish pub in Tokyo. “Good business for him today,” he laughs.